It's been a long time in the making but it looks like certain types of software related patents are no longer being approved at the US Patent Office. At a recent seminar I was fortunate to listen to Robert Sachs (author of the Bilski Blog) speak about patent rejections in the software and e-commerce space. The numbers do not look good folks. The picture above was generated after looking 175,000 patent applications in a variety of different technology areas. 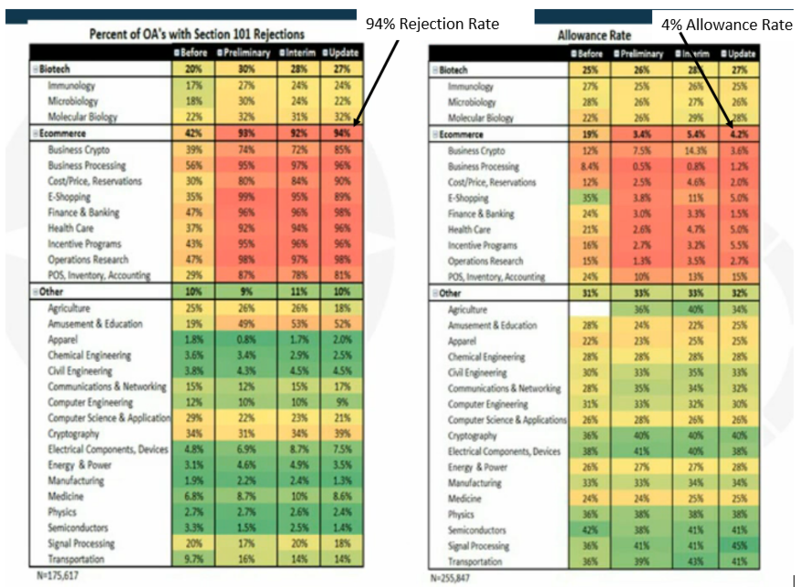 As you can see by the first arrow, patent applications in the e-commerce space had a 94% rejection rate under 101. In the table above the "update" column refers to patent applications examined after the USPTO updated their guidelines on software patent examination. For non-patent people, a "101 rejection" means that the patent office does not consider your invention patentable because the subject matter does not qualify. For example, things like "abstract ideas" are not allowed to be patented and recently (within the past 6 months), most software related patents are getting rejected as being an "abstract idea" or unpatentable under 101. This point is further shown by the second arrow in the image which shows only a 4% allowance rate for e-commerce type patents. Note that these are e-commerce type patents and more technical software type patents such as software to compress file sizes and encryption type software systems will most likely have a higher allowance rate. In my personal opinion this means that if your invention is software (including a mobile app) that has anything to do with online shopping, online banking, online dating, or e-commerce in general the chances of you getting a patent allowed is very low. If however you are a technical software developer say working on software methods in robotics or software methods in image processing than those very technical type software patents may still be allowable. 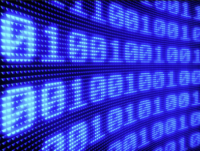 Should we still be filing software patents? It really depends on your business strategy. I usually tell people if you think that having a good patent will make you rich or get Google or Microsoft to buy you for millions of dollars than that is (probably) not going to happen simply because you have a good patent filed. If however you are building a full business around your software and growing your user base than having a patent or having a patent application filed may be one extra asset that you can bring to the table when it comes time to raising money or selling your company. Even if the USPTO does not allow your patent there is sometimes value to having filed a patent application. For example, being able say "yes" when a potential investor asks you if you have filed a patent may be worth the cost even though there is a low probability of getting your patent allowed. « When you should NOT file a patent	» Is my idea patentable? Top reasons why a patent may get rejected.